Citation Information: J Clin Invest. 2012;122(1):368-382. https://doi.org/10.1172/JCI59411. 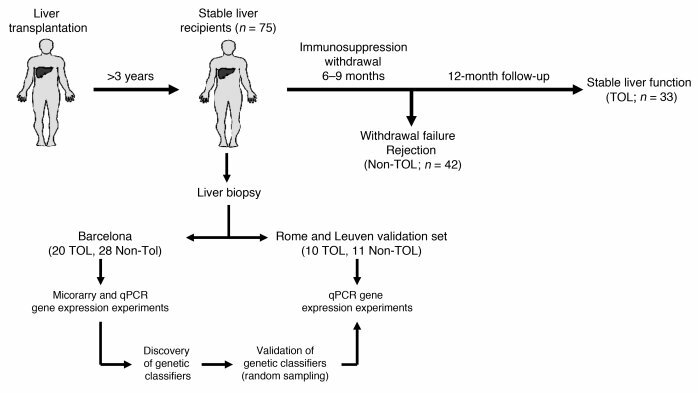 Stable liver transplant recipients with follow-up beyond 3 years after transplantation were enrolled in an immunosuppression withdrawal clinical trial. Drugs were gradually discontinued over a 6- to 9-month period, and patients were followed for an additional 12-month period. Protocol liver biopsies were obtained at study onset, at any time rejection was suspected, and at the end of the study in patients who did not reject. Patients who maintained stable graft function during the entire duration of the study and in whom no signs of rejection were noticed in protocol biopsies were considered operationally tolerant (TOL). Patients who underwent rejection at any time during the follow-up were labeled as non-tolerant (Non-TOL). Pre-weaning liver biopsy differential gene expression was assessed in a training set of TOL and Non-TOL recipients (all from Hospital Clinic Barcelona) employing whole-genome microarrays. A panel of selected genes was then analyzed by qPCR, followed by a search for predictive genetic classifiers. This was accomplished employing a random splitting strategy that incorporated an independent set of TOL and Non-TOL recipients (from University of Rome “Tor Vergata” and University Hospitals Leuven).